Informed Uniform: What Cause to Wear? I’ve never had luck with jerseys. Maybe it was the allure of free-agent money, but it always seemed like a player would be traded or sign elsewhere the second I bought his jersey. Later on this manifested itself as owning “retro jerseys” even if that was not the original intent. Early victims included Charles Barkley’s #34 Suns Jersey, Grant Hill’s #33 Pistons Jersey, and Shaquille O’neal’s #32 Magic Jersey. When my parents moved to Seattle, I immediately bought a Ray Allen SuperSonic’s jersey. He was traded 6 days later (to the Celtics!!). My sour luck extended to baseball. I would try to select a jersey of the Red Sox player LEAST likely to join the Yankees. After the 4th jersey went to the graveyard (thanks Damon, Lowe, Ellsbury, and Youkilis), I threw in the towel. A few years have gone by since the jersey curse of the 1990s/early 2000’s. While today is in fact Jersey Day in my office, jerseys are now normally relegated to a day off or the weekend errand run. The question, “What jersey to wear?” wouldn’t normally cross my mind. With the return of football, all eyes have been on San Francisco backup QB Colin Kaepernick and his decision to not stand during the national anthem. The easiest way for fans to show their support has been through jersey sales. His jersey sales have skyrocketed to #1 in the National Football League. Kaepernick, in turn, is donating the proceeds of his jersey sales to communities in need. Wearing gear with a company logo, an athlete’s name, has more meaning than just fandom. I’ve joke of the prospect of treating my high holiday kittel like a NASCAR vehicle, decked in potential endorsements. While I may never go to that extreme, I have found meaning in supporting causes, victims, and research in the garments I choose to wear. Modern fundraising allows those of us fortunate enough to buy a new t shirt once in a while to support in dollar and in visual manifestation of such causes. I showed support to a number of causes through charitable gifts, but receiving something tangible in return allows me to be a transparent advocate moving forward. When you are picking out that t-shirt to wear to do grocery shopping or to attend your kid’s soccer practice, what would it mean to find meaningful causes close to you, to go beyond your checkbook? Wear those shirts that show who you’re thinking about. Wear it, share it. At the very least, it’s a conversation starter, but at its peak, you have the chance to share important causes with others. 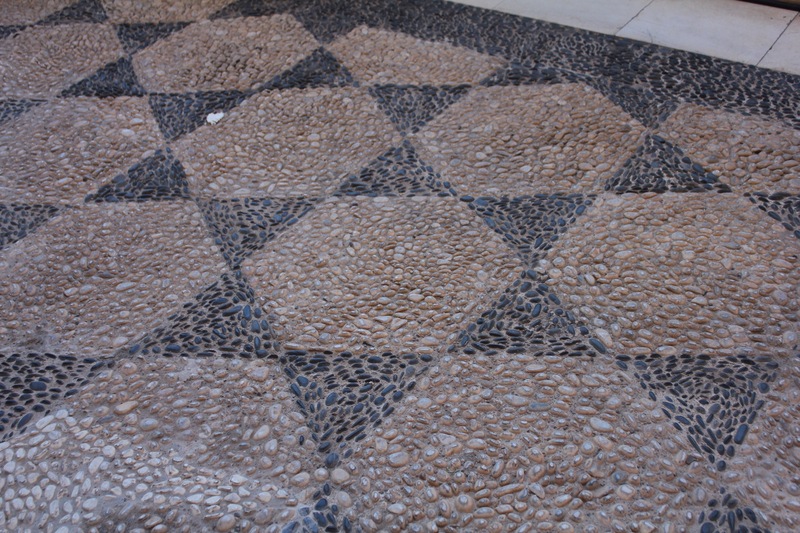 It was a potluck last day as we made our way from the Galilee to the ancient city of Tzippori, home to some exquisite mosaic floor designs. Tzippori also housed the ancient rabbinic Sanhedrin court following the Bar Kochba revolt, at the time of the Mishnah codifier himself, Judah Hanasi. 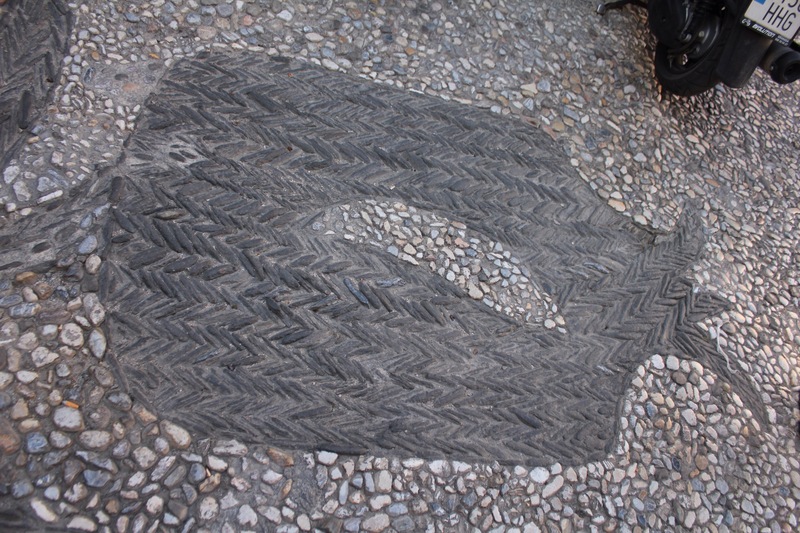 Seeing the zodiac symbols on the ancient floors (and also learning how they used a “Botox” approach to restoring it) reminded me of a synagogue in Boro Park that also has zodiac symbols in its sanctuary (guess they caught on). From Tzippori we traveled to meet our P2G friends from Hadera at the youth crisis village Neve Michael. We meet Hava, who I met 3.5 years ago on a Federation Educators’ Mission, as she reiterates a common need to heal the world: love. I was happy to be wearing a t-shirt with words of love inspired by the words of Lin Manuel Miranda. We tour the facility and learn about Sulamot (http://adipose.org/support/music-for-social-change/ ), an organization that partners the village with members of the Israeli Philharmonic. All the kids want is a sense of normalcy and to be loved. Quite powerful. As a side note, I didn’t think I could have a greater adventure than meeting another doppelgänger on Wednesday morning. But alas! Hana mentioned jokingly that she may lock the door to our meeting room until we raise enough funds to support their cause. I subsequently got locked in a bathroom stall and had to climb out a window and jump 15 feet to the ground! I WILL make it back in one piece for Koltrain Friday night!!! We returned to Tel Aviv after a photo stop by the Roman aqueducts (a short drive from Hadera). 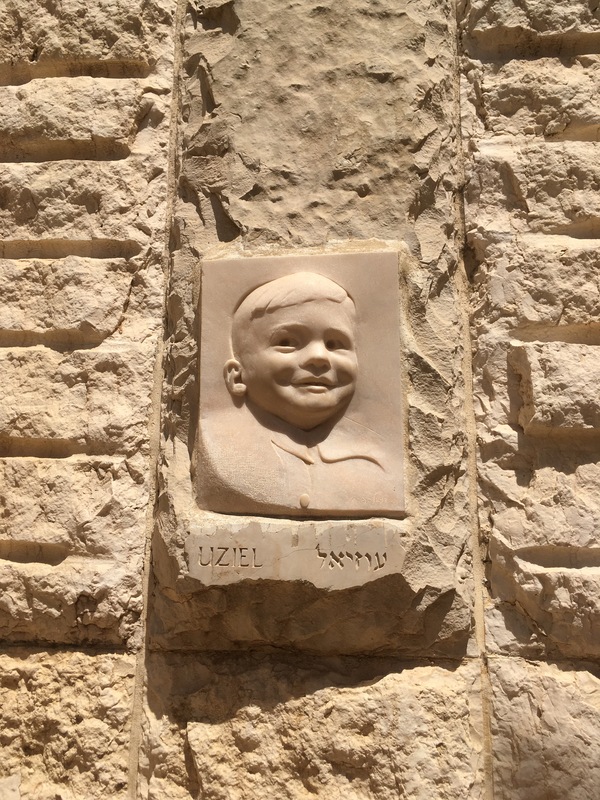 We tour Tel Aviv’s first street as well as learn about the craziness of May 14,1948 and all that had to transpire to create that moment of David Ben Gurion announcing Israel’s independence. We had a celebratory dinner by the airport before heading in many different directions. I hope that our trip was transformative for everyone who participated. Our guide, Morgi, was knowledgable and sensitive to the needs of all. You can feel her love of people and country when we ended up meeting a few dozen of her friends/fellow guides/students along the way. Our youth guide Shira really connected with our families and our driver Adi was also fantastic! I’ve never experienced parallel parking like I did these past few weeks. The Keshet director, Yitzchak Sokoloff, described his logic in creating trips that parallel those life altering teen tours- this was an active trip, a journey for people to push themselves physically, mentally and spiritually. It was an opportunity to take a different path. Israel is constantly growing- upwards and outwards. There are so many layers to Israeli history, Israeli society, and Israel’s future. On the first day of the trip, Assaf Luxembourg gave us our first image of Archaeological layering- comparing it to startups being acquired, one on top of the other. 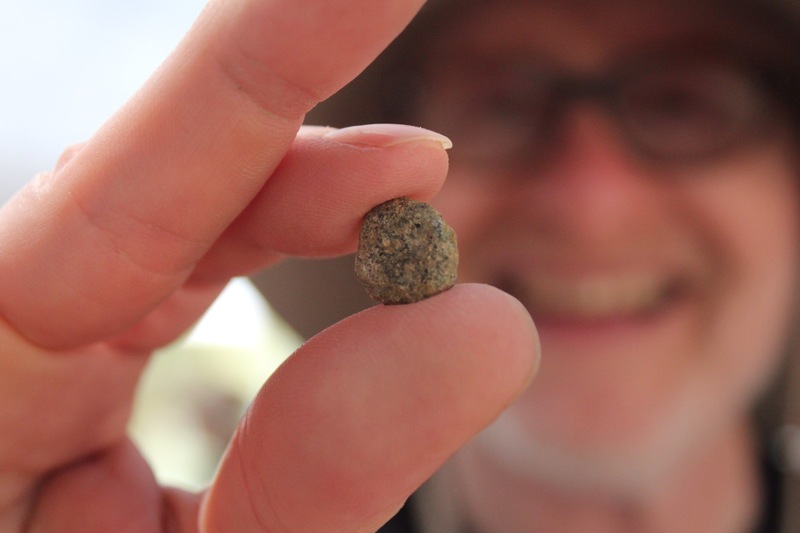 Just as an archaeological site grows and expands as we unearth more of our history, visiting Israel, being part of its awesomeness, allows us to dig deeper and appreciate the foundations on which it was formed and the newest layers that add it to its flavor. Wherever you travel in Israel, there are mezuzot on the door posts of Hotels, restaurants and other public spaces. A mezuza is not only a reminder of God’s presence in our world, but where we come from and where we are going, a reminder of where home is. Like our Torah reading Masei, it’s important to recognize the slalom posts on our journey. When we were leaving Ben Gurion Airport, heading through the tunnel before boarding our plane, I noticed that the mezuza was on the left side of the doorway (the opposite side). As we leave Israel, it’s a subtle reminder that Israel is home. I hope everyone who journeyed to Israel, many for the first time, feel that sense of home. L’hitra’ot- see you again soon! Breakfast in Israel (and more specifically in Israeli hotels) has no equal. People may talk about the great Schwarma or Falafal joint, but as we know, breakfast is the most important meal of the day. 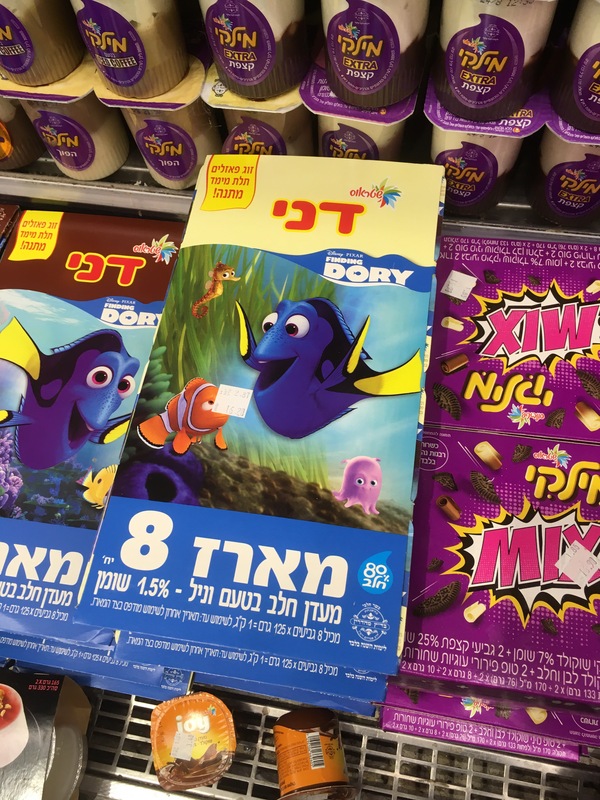 Each hotel tried to outdo the other- in Hagoshrim, a kibbutz known for its hospitality, we have pizza, fish, chocolate milk, shakshusha, fresh fruits and vegetables, cakes and more. What’s most interesting to me is the chaotic beauty of watching people of different religious and ethnic backgrounds (a large Muslim guest list) all eat together. Food does seem to be able to bring people to the table!We also happen to bump into a native Jacksonvillian, Bobby Brochin, who was childhood friends with Bruce Horovitz! On our way to Tzefat (or Safed, or Zafed, or Zafad), we make two pit stops. The first is the Naot factory store- a place I went to on Ramah Seminar, but during my rebel phase, when I refused to watch Titanic or wear sandals like everyone else my age, I never even entered the store. I’ll be sporting from stylish shoes next week for Israel Shabbat. My how times have changed!! Our second stop is in the border kibbutz Malkiya, steps from the Lebanese border. The head of security describes the matzav (mood)- there are two things he prides his community on- strength and identity. The kids are happy running around outside while we get a tour of one of the bomb shelters decorated with wall to wall animal murals. He is honest with us- when they do use the bomb shelter, all bets are off- up above everyone is cordial, but if two families share a tight space below ground, bickering is a common language. Moral boosts are a must- it reminded me of the film Rock in the Red Zone! We meet a few soldiers who appreciate our gifts before heading to the base itself to meet with more soldiers. I encounter my long lost son; or kindred spirit; or 2nd doppelgänger. Barak is in the Golani brigade (check out Facebook for pictures) but is a trained musician who has played at Carnegie Hall and Lincoln Center! My first doppelgänger experience was at an A Capella festival- who knew lookalikes had talentalikes!? 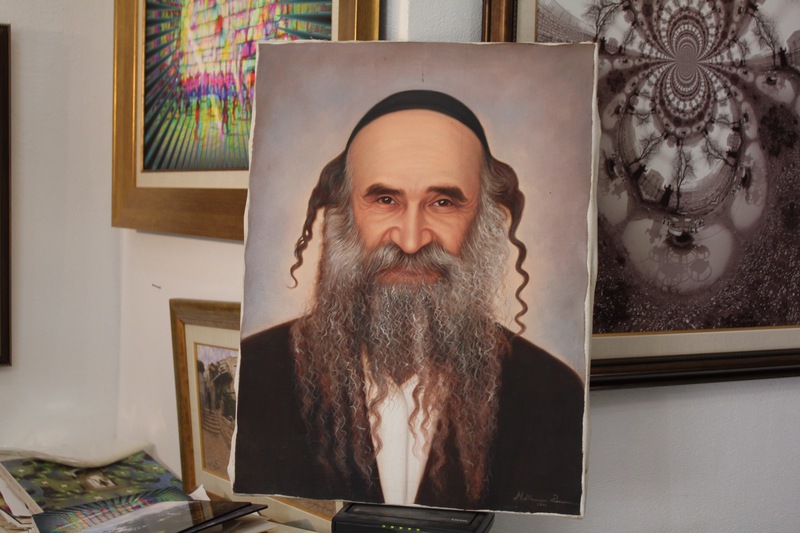 We walk through the artist section of the old city, where I highlight a great micro calligrapher, who shows us the entire Torah written out in one painting. I stop by a familiar art gallery and notice a painting of a familiar face- the artist Kaszemacher. The gallery owner asks me to stop taking a picture, thinking I’m taking a picture of his works. I tell him I am taking a picture of the man (see below), since my family met him on multiple occasions. Kaszemacher passed away a few years ago, but have painted an photographed even after he became blind. I tell him how 25+ years ago we used to get a tour of Kaszemacher’s studio across the street as he explained the meaning behind his work. The man appreciates my own appreciation of the artist. The man is his son. 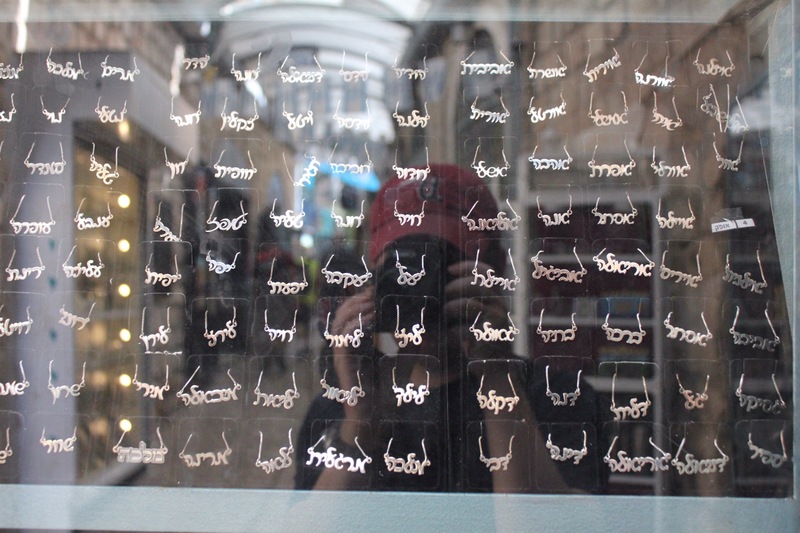 I look through many of the galleries and find one with 200 hebrew name charms for females. No Dafna. No Rena. No Leora (photo attached) What is the world coming to?! We meet with an expat Avraham, who gives us a brief summary of Kabbalah and how it inspires his own work. He talks about the power of a name and how each letter is intertwined into the Kabbalah map outlined in the Zohar. He shows us a series of paintings which are the computer imprint of the sound waves of the 100 shofar blasts we make on Rosh Hashana. We tour two of the Safed shuls, including one of 4 Ari (Isaac Luria) shuls that had been bombed. And our Israeli dance set, including Mayim, since we love drinking copious amounts of water! Tomorrow is our last day (technically we have 30 minutes between midnight and 12:30am on Friday as well). It is great to see how much everyone has enjoyed the experience and I can’t wait to hear what they have to say next week at our Israel celebration Shabbat! 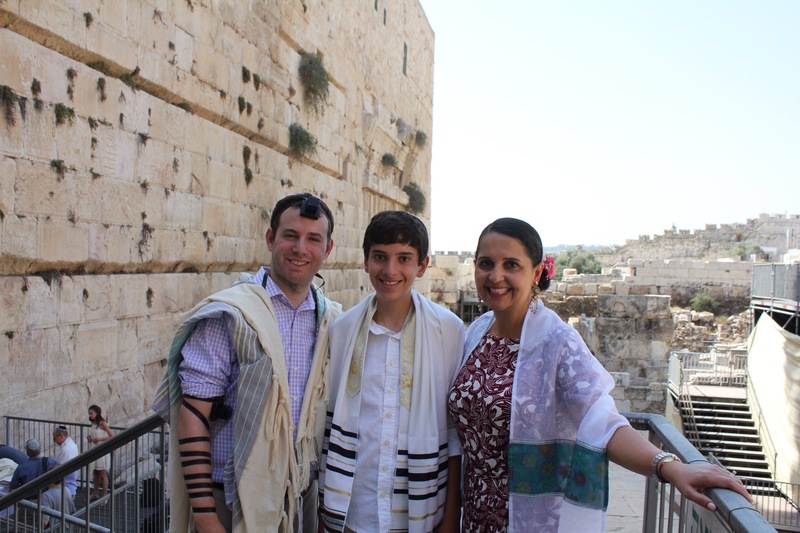 Mazel tov to the Levine family as Christina and Ethan celebrated their bnei mitzvah together in the egalitarian worship space adjacent to the Kotel. Christina and Ethan worked with me over the past few months studying the Torah portions (in a quirky way, we actually split the double parsha this upcoming week into two separate Torah portions, one last week and one this week since Israel was reading one Torah portion ahead of us in the diaspora) as well as major parts of the service. Our prayer service began shortly before a number of other bnei mitzvah would take place alongside ours. Noise was somewhat of a factor, with a “siman tovs” echoing throughout the area. We couldn’t use the darbuka or tambourine, but I was able to use the shtender/eggs to add a percussive sound to our service. Ethan and Christina did an amazing job, aided by the energy of our kehillah. We came in close together for the entire service, so we were able to hear their leading/divrei Torah as well as sing along to the service in one voice! 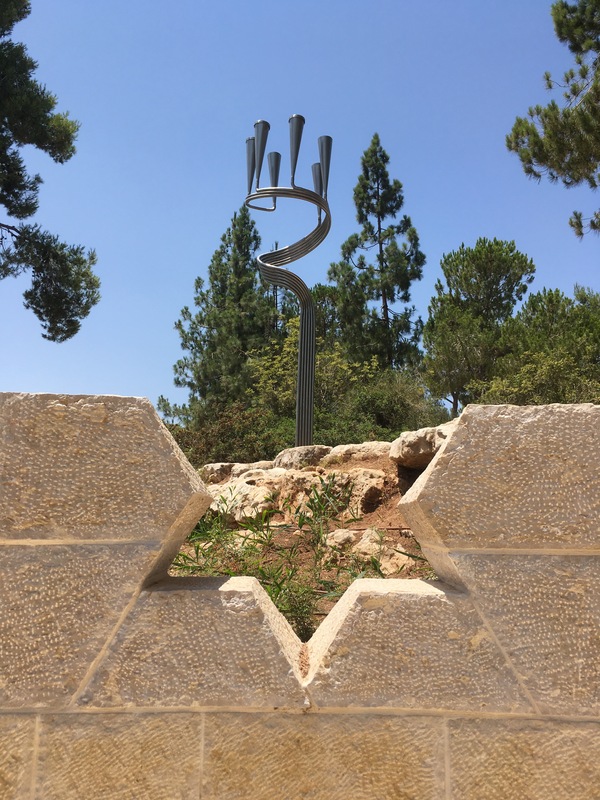 There were a number of other participants who had never had an Aliyah or who desired to have one in that space- alongside the place where the temple once stood, as we read of Zelophahad’s daughters who fought for equal rights, as we prayed man and woman together. What a gift! As we concluded the service with Mourner’s Kaddish, I reminded the group that the prayer has nothing to do with death, but rather a hope for completeness in our lives. How we live our lives is the true testament to ensuring that those we’ve lost will have their name be a blessing for us, for we need to lead impactful lives to realize how much they are a blessing. Speaking of gifts, I remember visiting Yad L’kashish as a student on Ramah Seminar a number of years ago. They have since expanded into a well oiled operation that provides work and a hot meal for senior citizens. The group interacted with the workers, most of whom came from the former Soviet Union. We head over to East Jerusalem and on to Emek Turim, sifting through unexcavated archaeological remains looted from the Temple Mount. We divide the buckets of chazarai into 6 salvageable materials. 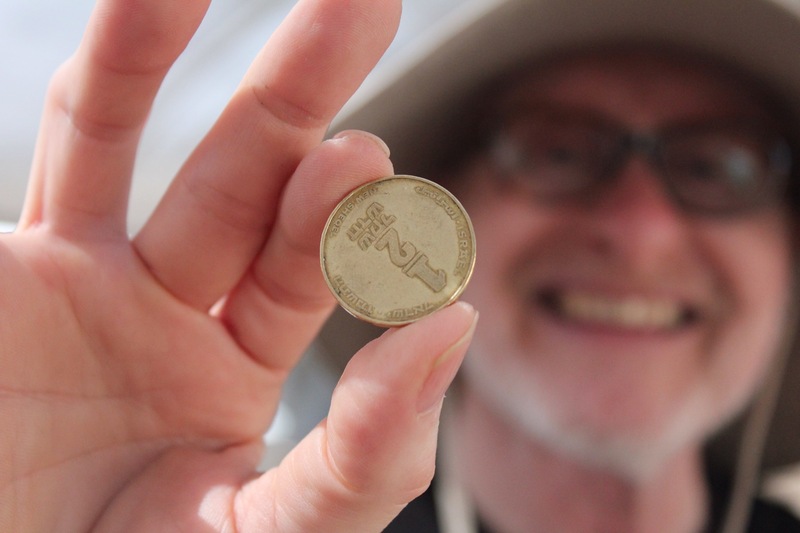 We find bones of kosher animals, glass, pottery, and even 2 2000 year old coins (way to go David and Steven- picture of David below). Heading up north to Tiberias, we pass a few spots where I have a deja-vu moments to my childhood family trips to Israel- almost falling of the giant water slide and staying in a hotel with a set of ruins right out front (now called the Leonardo Plaza). 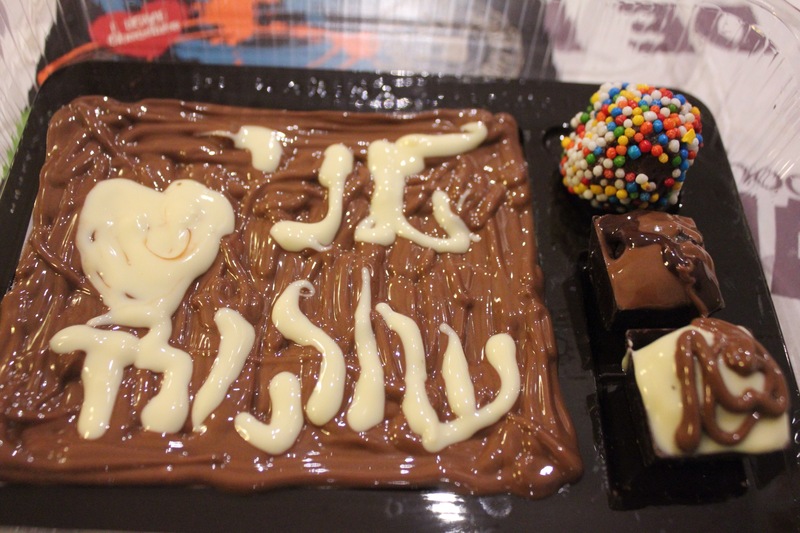 At our celebratory dinner at Refaello, I share a few stories of “connection” that lead us all to this joyous occasion- the bnei mitzvah, Rachel’s birthday, and more! Ivy and Josh celebrated their 10th anniversary a few weeks ago and wanted to travel with their parents. Michael and Barbara suggested the synagogue trip, their chavura followed, and there was a chunk of our group. Ethan deciding to share his bar mitzvah moment with his mother brought on another set of participants. I made the claim that Yitzchak Sokoloff, head of Keshet, mentioned his grandfather had started a hebrew school in Worcester MA some hundred years ago. Maybe if he doesn’t do that, my mother doesn’t move to Worcester to run a Hebrew school, I don’t move next door to a cantor and become inspired to be one myself, and this trip doesn’t happen. Small decisions in life have ripple effects enabling such a joyous day, and such a powerful journey to Israel! We get a late wake up at Kibbutz Hagoshrim in the upper Galilee. We had passed an area where the Israeli poet Rachel was buried (her request was to be buried overlooking the Sea of Galilee). Rachel wrote many poems that were later set to music. In particular, Naomi Schemer (who is also buried near Rachel according to her wishes), wrote music to many of her poems, including the poem Kineret. 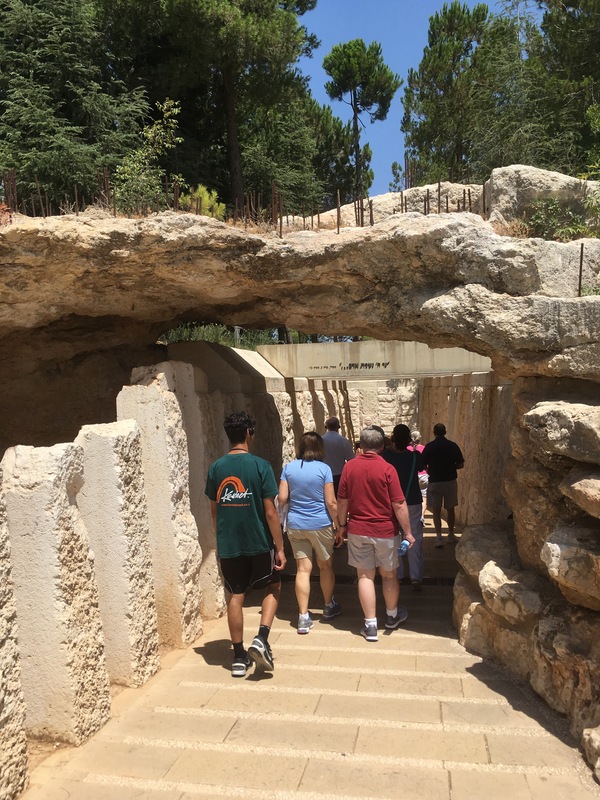 We walk through the ancient ruins and lush Tel Dan Nature Reserve and Archaeological site, where a group is still excavating during our visit! We enjoy seeing the greenery, a stark contrast to the unshaded blandness of the dessert. Ascending the Golan heights, we view former volcanic activity as well as the new vegetation the Israelis are cultivating. 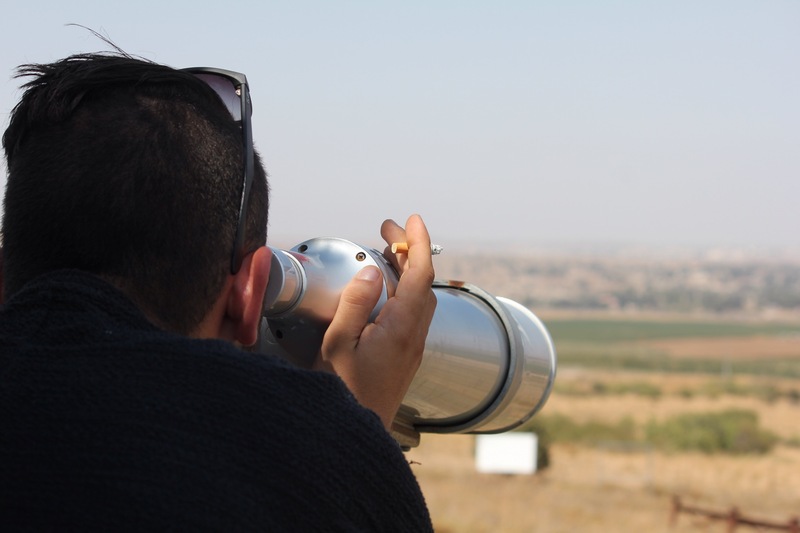 Looking over from Kuneitra we see Syria, the UN outpost, wind turbines and more as Morgi explains the border situations over the years. I remind some of the group about a sticker (of which I still have many in my office) that was popular in the late 1990s. I was also trying to think of a song about the strategic and moral boosting position of the Golan. Our lunch is in Katzrin, the only city in the Golan. We split into two groups as many of us try out our Catrina Ruby impressions at the De Karina (should have been Katrina) Chocolate Factory, while others taste wine at the Bahat Winery. We come back together for an olive factory tour, where they make olives into beauty products of all things! L’hitra’ot- share with you more tomorrow! Rabbi Kalonymus Shapira, the Rebbe of the Warsaw Ghetto, is quoted on the wall of the exhibition, questioning why the world didn’t turn back to water (i.e. The flood) when the Nazi’s began their horrific acts. At one section of the timeline, the visitor follows a pathway portraying the unthinkable Death marches that took place from Birkenau beginning on Jan 18, 1945 and ending May 10, 1945. At each stop you learn who survived and who did not. By the time of their liberation, only 120 of 3,000 survived the war. There were similar stories of agony, coupled once in a while by a story of perseverance and hope. Having visited a half dozen concentration camps and a number of ghettos, museums typically don’t emit the same level of emotion for me. The end of the museum experience was much more difficult this time as I had remembered. As I watched a video of DP kids singing a version of Hatikva, just as my daughter sings around the house, I began to choke up. If that wasn’t enough, I heard the story of Uziel, whose parents survived the war because the mother’s mother took Uziel away during selection at the Death camp, so that his mother would survive. The parents later helped create the Children’s Memorial in his memory. Uziel was 3 years old, the same age as my eldest. That did me in. Josh Weingram, husband of Ivy and son-in-law to Barbara and Michael Schneider, shared his personal connection to one of the Lone soldiers, Michael Levin, who always dreamt of joining the IDF. We visited Herzl’s grave, Golda Meir’s grave, and then the graves of Hannah Senesh, Max Steinberg and Michael Levin. Morgi points out the way the graves themselves are peaceful, tucking in those the country has lost, as well as how recent soldiers who died have a wider variety of ways people are remembering them at their burial sites. We said an El Malei as Michael’s 10th yartzeit is this upcoming week. I thought for a while as Morgi called all of the lone soldiers shlichat am, emissaries of the people, quite unlike a prayer leader being called shaliach tzibbur. We drove over to the Menorah in front of the Knesset before a night out on our own, our last night in Jerusalem. It’s been a jam packed few days as we transitioned from Tel Aviv to Jerusalem by way of the desert (a little indirect but I guess like Moses we weren’t good at asking for directions?). Wednesday morning we were treated to the first of a few talks by different sectors of Israeli society. 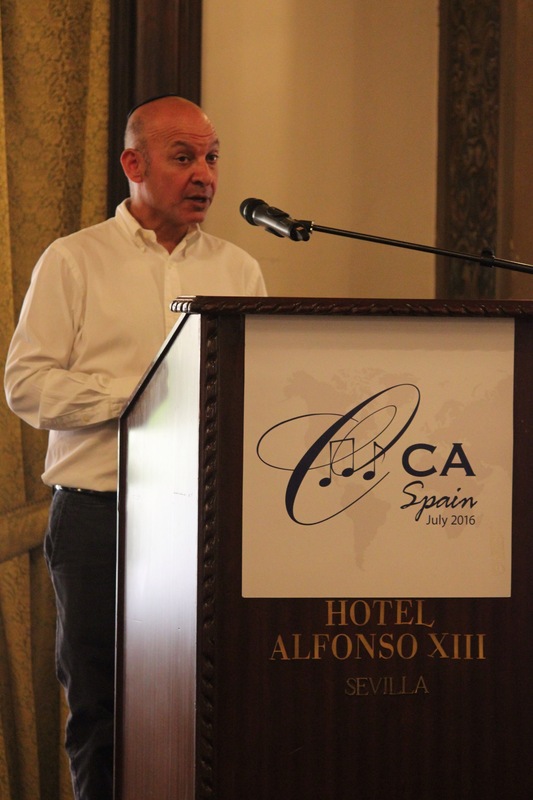 Assaf Luxembourg, a third or fourth generation Israeli, spoke about the tech industry. He also gave us some tips to experience Israel- act a little Israeli, eat some hummus, and interact with its people. We stopped by Rabin Square (I posted the melody of Shir Lashalom on the last blog) where Rabin was assassinated as we recreated the scene and discussed Yigal Amir’s bastardizing of the Torah to think that this was what God would wanted (Israeli society pre and post-Oslo was tensely critical of the Peace movement, with some sections of government/religious authorities calling for someone to “take care of” Rabin (often depicted to look like Hitler). A birthright group joined in a circle to sing “Lmaan Achai v’rei’a”-for the sake of my brother and my neighbor- a melody written by Shlomo Carlebach (text is used in our liturgy) and quite appropriate for the experience. and finally left Tel Aviv and headed to Kiryat Gat. It was at this time I started looking into top kosher restaurants in Jerusalem (for Thursday night’s free night), and low and behold our hotel in Tel Aviv had a 15th floor restaurant ranked #3 in all of Israel. Oops! Rabbi Sharon Shalom is an Ethiopian Orthodox Rabbi who serves a congregation of mostly Holocaust survivors. He is an engaging speaker who talks about his journey, his adjustment to Israeli society and the importance of speaking with the heart. 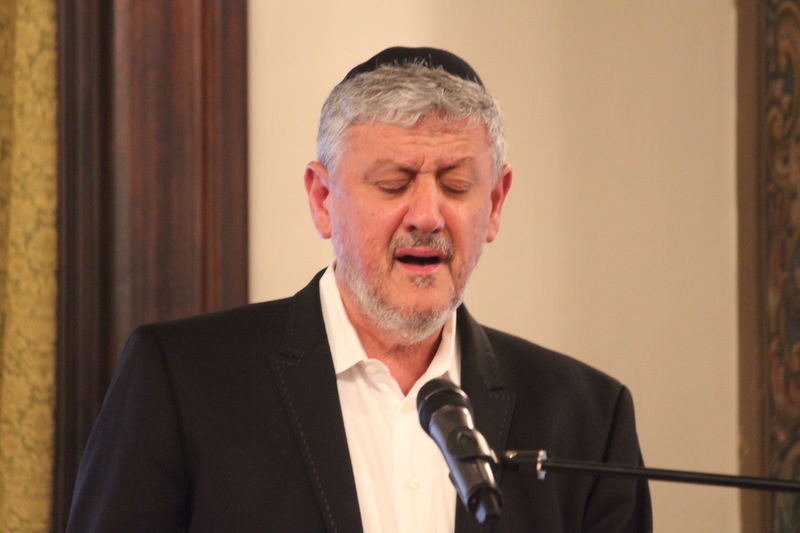 Musically speaking, the Rabbi is also a Hazzan and says that depending on what life cycle he officiates (really for whom), he will use the nusah and customs of that couple- he gave an example of Sheva Brachot being chanted a number of different ways! Our day is culminated by a late evening Camel ride and Bedouin hospitality. 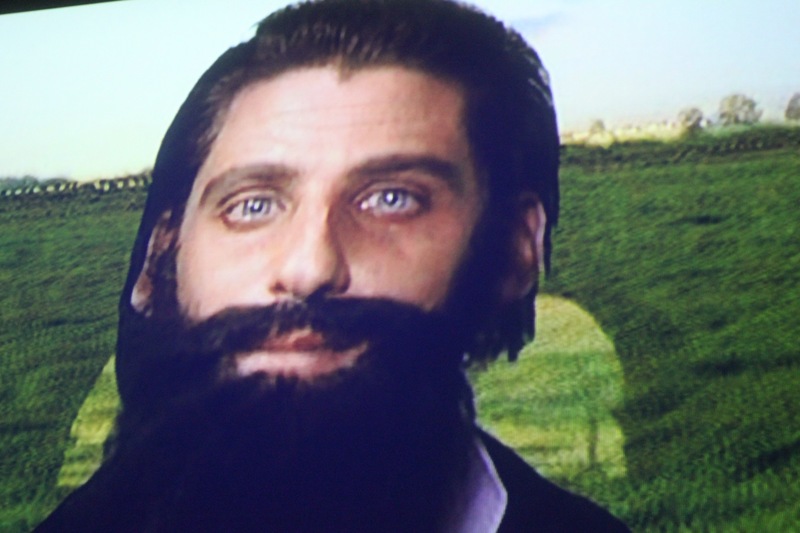 As we headed to bed, a group of Israeli soldiers started humming TLC’s Scrubs for some reason. Only in Israel!! I also look out at the clear skies and crescent moon. There are a number of Israeli songs that talk about the moon, but this one came to mind at that moment. An early morning (wake up call at 3:30AM) hike up Masada. So proud of ALL of our participants for making the early morning trek up the mountain. We enjoyed watching the sunrise and spent a few early hours recreating the controversial experience of the Jews living on Masada (from King Herod to those who committed suicide rather than give in to the Romans). As we were leaving the top of Masada, we left an open ended question of how these Jews should be remembered – as heroes? As a tragedy? In any event, this early Israeli perspective of “we may have been perceived as weak before, but look at all the might we have; look at all of the examples of those who rebelled” is prevalent. 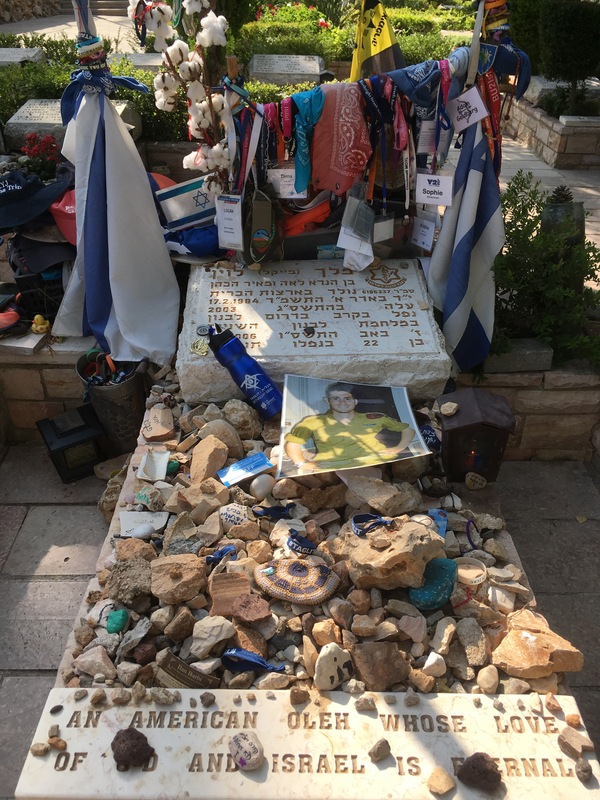 We’ll see that as well when we visit Yad Vashem – the first museum (before it was recently renovated) showcased the story of Mordechai Anilevitch, who died in the Warsaw Ghetto Uprising. 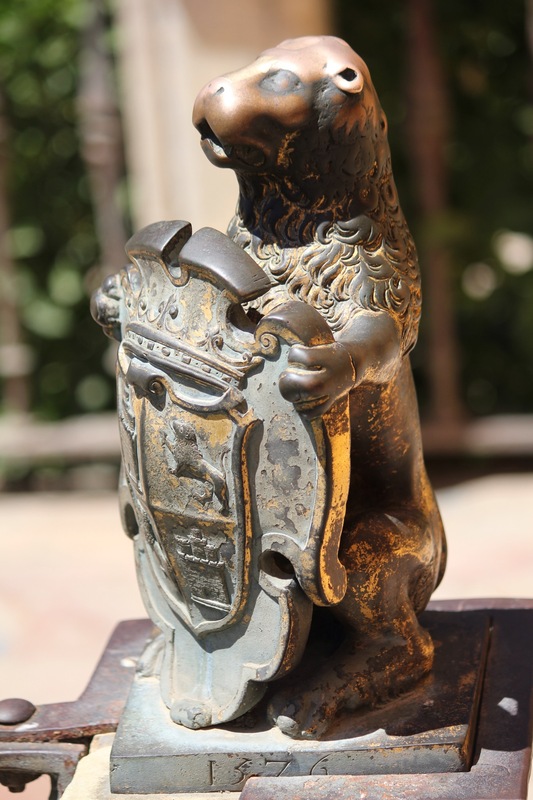 Early Israel wanted to associate with the heroic stories of strength and heroism. Afterwards (iwhat felt like 5pm already) we traveled down for a hike to the springs at Nahal David. Nahal David floods every year so the topography of where the springs are changes from year to year. It was a great surprise to catch our Jacksonville kids in the waiting area to enter Nahal David!! Having reached out to Seminar we had thought our paths would totally not cross on our journey. What luck! After a refreshing dip we headed to Ein Gedi and the Dead Sea. It was hot! It was salty! It was wonderful! We traveled to Jerusalem and made a Shehechiyanu to show that we are finally home in the ancient city. I sang an excerpt from Hameiri’s Yerushalayim as we gazed at the panoramic view of Jerusalem. Checking into the hotel, we had a few hours before our reservation at the Latin restaurant La Boca (half of us went to Eucalyptus). Whenever I have a few hours in a city (this happened in Madrid a few weeks ago), I like to walk around for an hour to acclimate myself. I walked up to the Old City through the Jaffa Gate and headed towards the Kotel (I don’t think I’ve ever entered from that direction). It was cool to hear all of the languages in the shuk (some Italians speaking Italian with the Arab shopkeeper and bonding over their love of cashmere). I headed for the Cardo and realized there’s a shortcut to the Arab shuk back to the Jaffa Gate; and I didn’t even need Waze (An Israeli company)!! When we got back from dinner, a party was hopping across the street. A band played 3 songs in succession before going into a techno/DJ dance mod: Inyan Shel Zman (we used to sing in Pizmon, meaning “A Matter of Time”) what I refer to as Etmol haya tov (yesterday was good, officially called “Hayareach”- another Hayareach!! ), and John Denver’s Country Road. Only in Israel- Rak B’Yisrael! After traveling with the Cantors Assembly Mission to Spain, it is an honor and privilege to lead a group of 26 to our ancestral homeland. After an overnight flight from JFK, the majority of the group arrived Monday night and headed to our welcome dinner at the Maganda Restaurant in Tel Aviv’s Yemenite Quarter. After filling up on salads, we feasted on shipudim/skewers/shishlik and headed to our hotel to rest up! After a delicious Israeli breakfast- fresh breads, fruits, cheeses, with your choice of herring, egg souffles, and even ice cream, we began our first full day in Israel exploring Tel Aviv, named “Hill of Spring” after Theodor Herzl’s call to return to a Alteneuland. 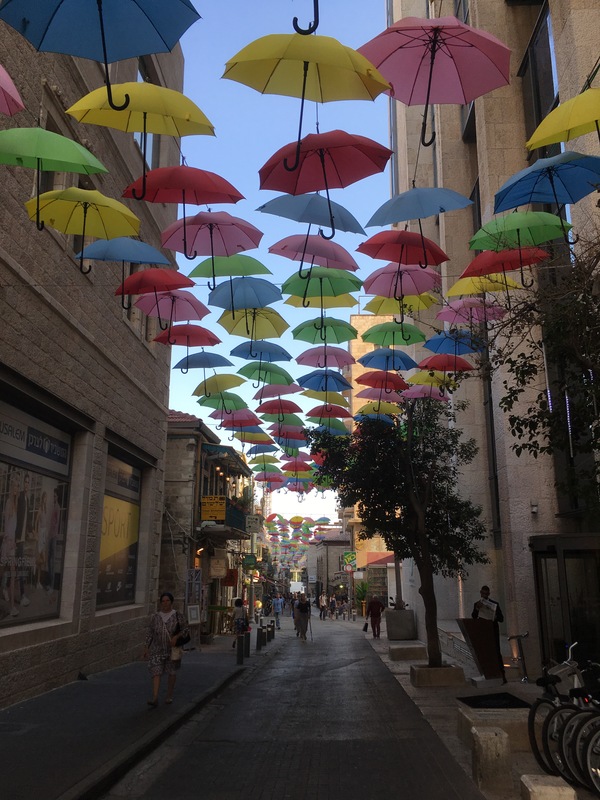 Our tours took us to 4 unique locations, all incorporating the music of Israel to tell their respective stories. We begin at the Palmach Museum. Palmach is the hebrew abbreviation of Plugot Mahatz. Founded in 1941, the Palmach, the striking force of the Hagana, was the precursor to the IDF. This interactive museum gave us a 90 minute tale of those who made up the pioneer defenders of the State of Israel- teens and 20somethings (Yitchak Rabin was an elder statesmen when he commanded his group at the age of 25!). The group assembles around a campfire and sings this Israeli classic (and a favorite of our longtime Cantor Abraham Marton z’l). 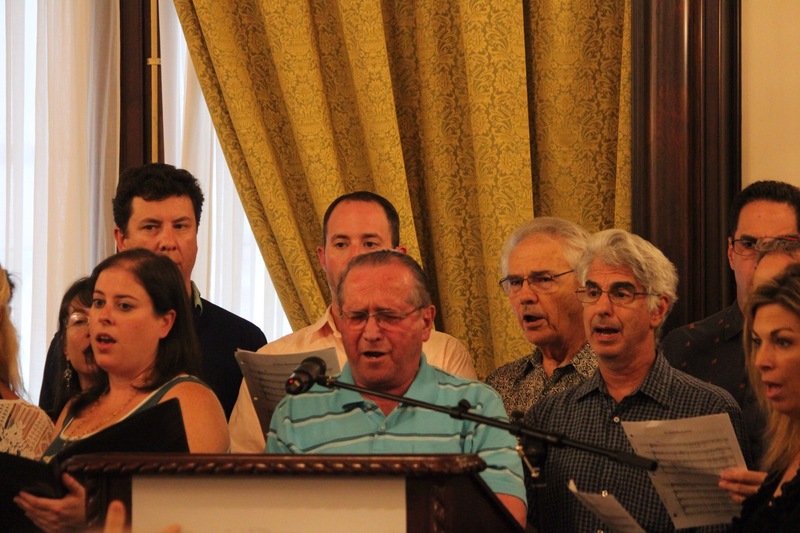 Seeing the valleys and the glorious land, in awe of the place they would be asked to defend and lay down their lives for, the group sings Shir Haemek. We hear the theme song for the Palmach. As we take the journey (with real live footage and a feature film made for the museum), the group connects with the different stories of those making up the Palmach- new olim, holocaust survivors, 2nd generation pioneers, etc. We hear about the struggle during the War of Independence and hear the melody of the heartwrenching song, Bab el Wad. 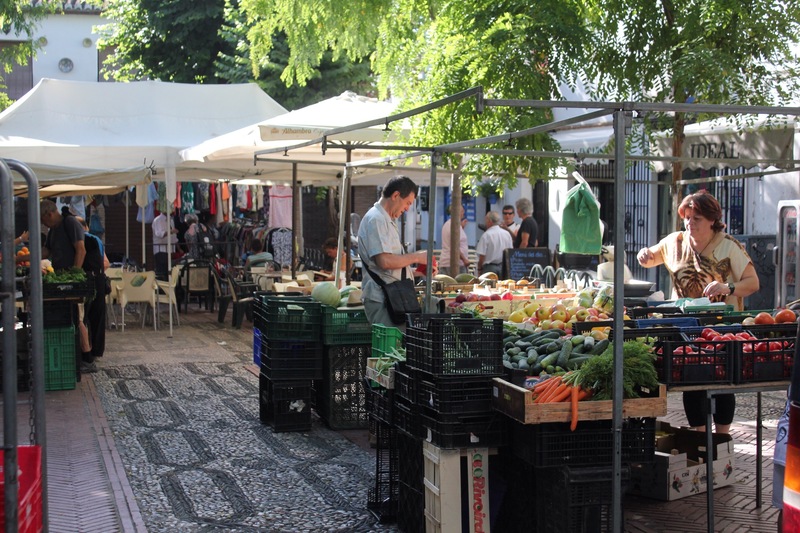 After the Palmach Museum, we travel to Nachalat Binyamin, the Arts & Crafts Fair adjacent to the Shuk. The group enjoys some free time and I even bump into Ami Yares and his bride to be (Mazel tov). Ami visited Jacksonville a number of years ago as a member of the band, The SHuk. How ironic!! As we enter the Rabin Museum (20% dedicated to his life, rest to Israeli history), we enter a large room with video of the night Rabin was assassinated. The crowd and everyone on the dais chants the words to Shir Lashalom (song for peace), seen below. The words were found in Rabin’s pocket following his murder just 15 minutes after the peace rally ended. The museum flows similarly to the recent documentary Rabin, In His Own Words (highly recommended). Since the State of Israel sponsored the museum (and not as a memorial to Rabin), they do paint a fairly streamlined view of every conflict- war/political campaign etc. Our group learns a new perspective – the height of the Generals of ’67 and the negativity towards politicians and military following the Yom Kippur War of ’73. We feasted at Na Laga’at Center (Na Laga’at means “please to touch”), located at the Jaffa Port in Tel Aviv. The Center is comprised of the Nalaga’at Theater, home to the Deaf-blind Acting Ensemble. We ate at Cafe Kapish, served by very friendly waiters who also were deaf. We were blessed to see the performance “Not by Bread Alone,” an interactive and thought provoking story in which the actors share their hopes and dreams with the audience. One of the most striking aspects of this performance is the choreography- there were a number of emotional moments in which the main narrator (deaf and blind) maneuvered across the stage with the helpful hands and arms of his actor counterparts. It really was poetry in motion. An older woman, who in the story courts an older gentleman, plays a song on the keyboard that she remembers from childhood (written in 1939). The audience is given the lyrics to sing along with her beautiful playing. At the conclusion of the program, the audience is again asked to join in with another song- actors make out the sign language so one can sing the song with their hands and their mouths (unfamiliar but stirring song). The evening culminates a powerful day showing the spirit of Israel and the spirit of Israelis- strongest when they work together to create such impactful moments. I’m so grateful to have experienced such a moment this evening! 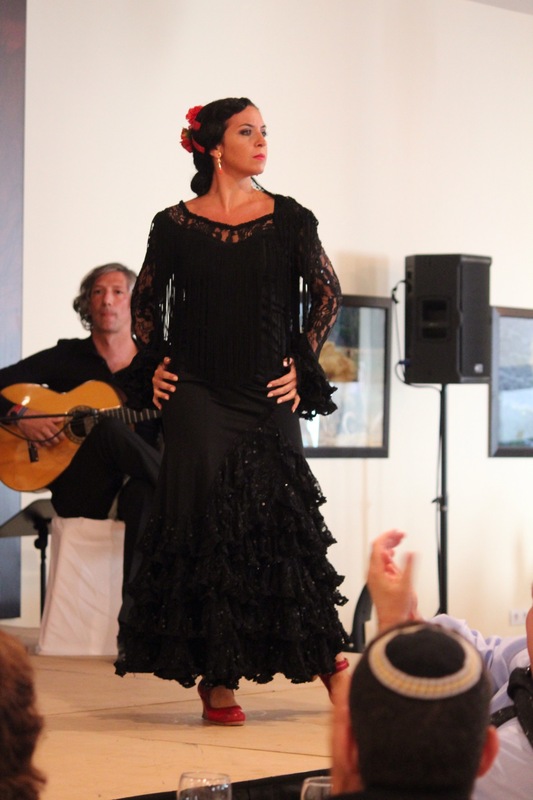 As the Israeli Ambassador to Spain put it at our Sunday night concert, “Music transcends time. It is the image of our souls.” Whether dancing for a packed house for Shabbat services, an impromptu chanting of Ani Maamin in a church (that was once a mosque, that was once a synagogue), or a sing-along of Israel’s greatest hits, our mission to Spain showed us all that beyond Am Yisrael Chai (the nation of Israel lives), Lev Yisrael Chai (the heart of Israel lives). During our last day, Professor Berk reiterated this idea that perception is reality. This goes for human history, but as we go from the learning and singing, this “camp-like” bubble of an existence over these past two weeks, away from the chaos of society and the Pokemon Gos of the world, it is our collective responsibility to make sure that the perception of both the past and present remain as genuine and introspective as possible, so that the future remains bright. 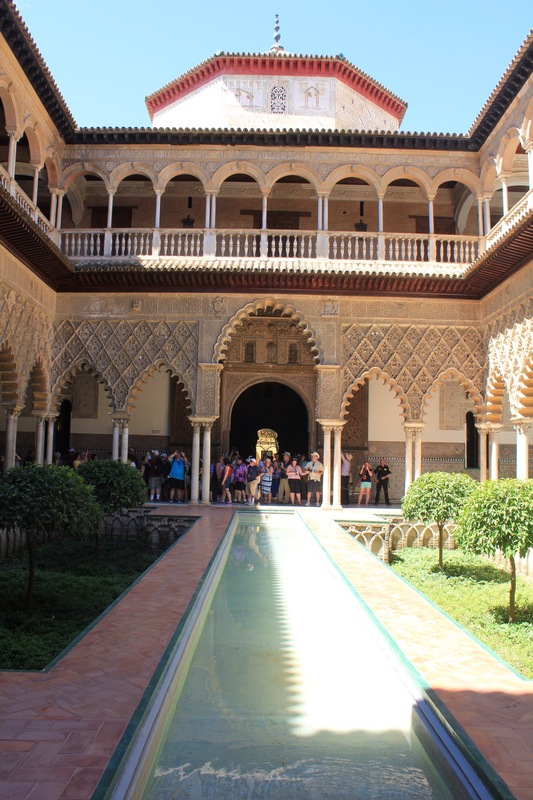 Our last day included a morning tour of Seville, including a visit to the Cathedral Palace (where Columbus can be found) and a tour of the Royal Alcazar Palace of Seville. 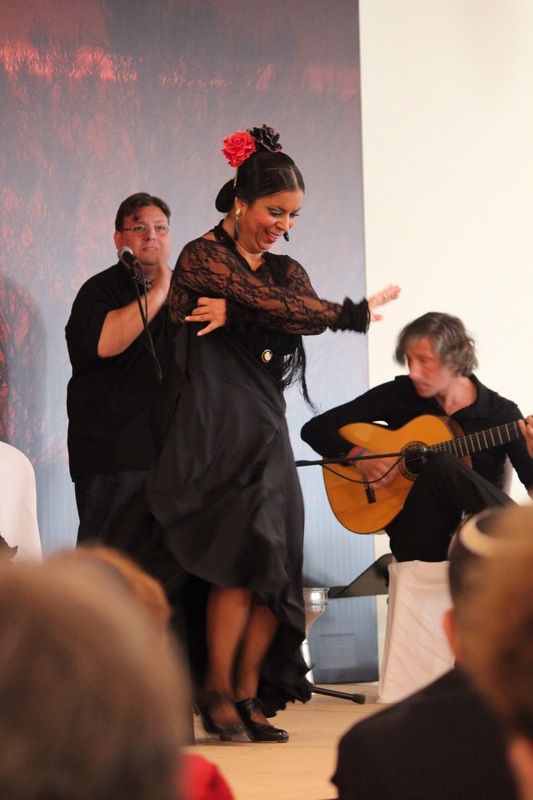 The evening was punctuated by a Flamenco performance and Israeli song festival at the Real Venta De Antequera, a place that normally hosts bull fights! Berk’s last lecture of the trip was sponsored by my synagogue, the Jacksonville Jewish Center, and I do want to thank the synagogue and leadership for giving me opportunities like this for personal and professional growth! Most of Berk’s lecture focused on Franco’s rule and this play between European countries following World War II. To be honest, my focus during this time period was always on Germany, Poland, Russia and even Italy. Hearing about Spain’s position in this period brought the art work we saw at the beginning of the trip (the film about mass poverty, Picasso’s Guernica) back to life. We can say “never forget”, but if we never know, it’s hard to never forget. As the lecture turned into a question and answer, Berk focused his energy on what he saw as the eventual inclusion of Turkey into the EU. As the gateway to the Middle East, Turkey is an important political/military ally. As the borders would open with its inclusion into the EU, the conversation about security is a very serious one. This talk, two days before an attempted military coup in Turkey! I learned a lot about the interplay between religions; the interactions between factions of religions. 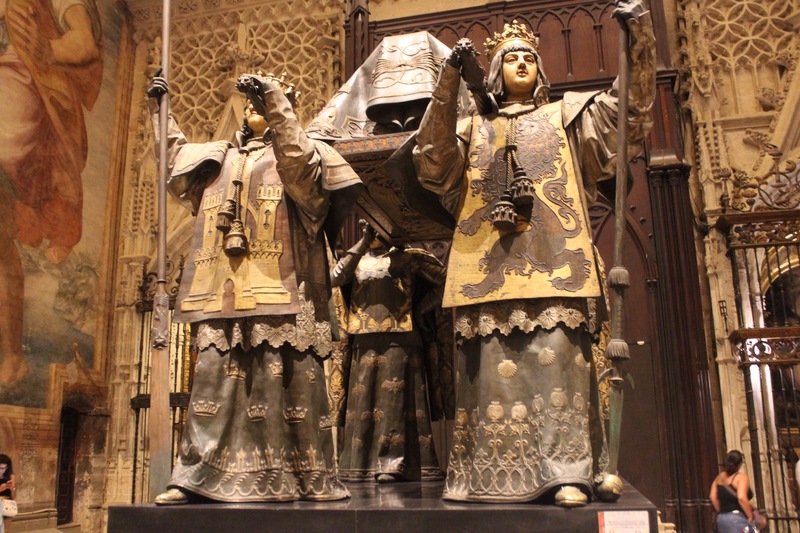 Spain’s Jews had a Golden Age, and there was a not so golden age. I learned a lot about post-WWII Spain. 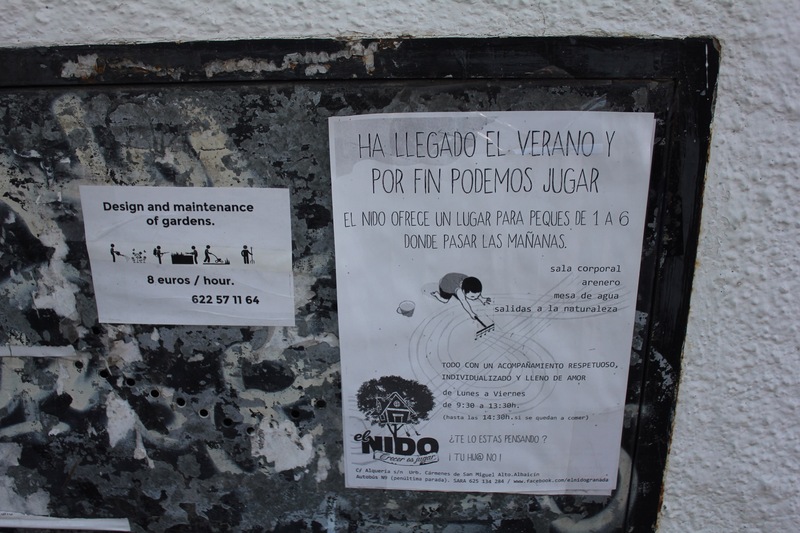 Meeting with and hearing the stories of Masorti Jews in Spain today, I found it worrisome that we don’t pay more attention to this group of Jews trying to create a Casa Sefarad in Spain once again. The Joint Distribution Committee gives very little to the Masorti communities in Europe. Hopefully through twinning and through education, this will change. The Golden age will never return, but love of culture, love of a modern Spanish Jewry can! I love being in a country where everyone pronounces Dafna (airport/customs personal, hotel receptionists, bartenders) the right way! Kippah- I felt weird not wearing a kippah (for security reasons it seemed like more people went kippah commando or hat on this trip vs. Germany, ironically). It’s not like I didn’t scream tourist with my fanny pack, diaper backpack, and camera bag. 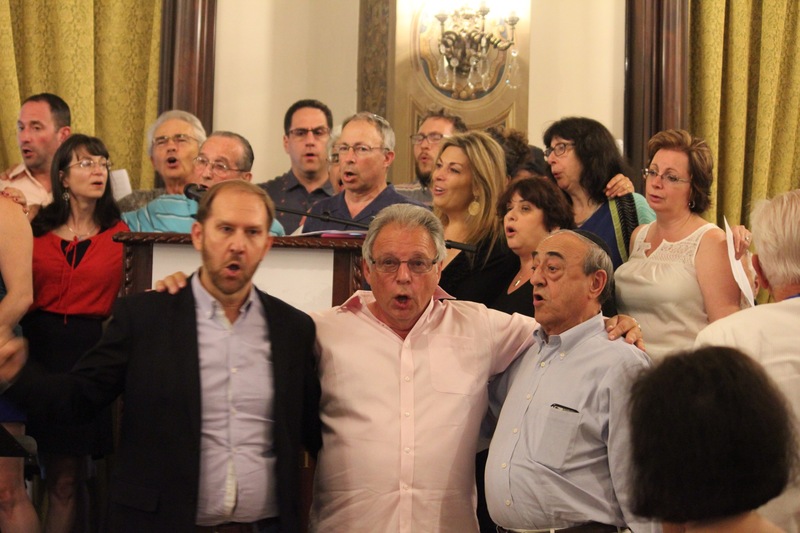 Most importantly, I realized that more than the cantorial music they sing, these cantors on our trip, and I gather the same can be said about the cantorate in general, are loved. 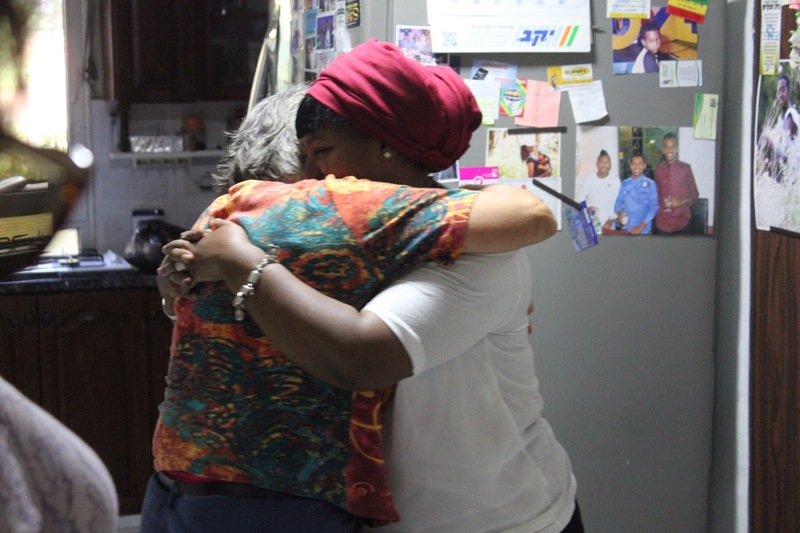 They are beloved by their friends and congregants (and congregants who are friends). Hearing how non-cantor trip participants (of which there were 300+) spoke about my cantorial friends in such glowing ways was truly inspiring. As a social experiment, one need only look at the dozens of photos I posted from our concerts for those back home to enjoy. These were not videos of cantors singing, but cantors smiling and loving what they do. To wake up to hundreds of notifications saying that hundreds of people that I don’t know loved/liked/commented on my photos shows the impact our cantors are making today. The way in which we interpret music is important, but the way in which we engage with our community through our personalities and stories means so much more. From strength to strength! As I mentioned yesterday, Granada was the last Muslim stronghold. We skip forward to the yer 1500, where Granada is now the home to forced conversions. Our guide, Rosa, paints a picture of 1502, as Muslims lined in front of their former mosque (now a church) ready to be baptized. 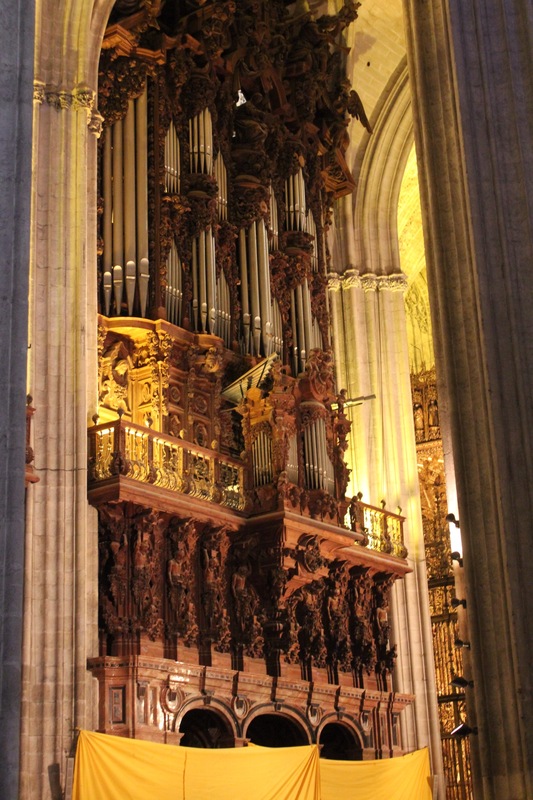 Conversion often created more rifts within the Christian community, as new Christians were designated separately from the old by being classified as “Moriscos.” In many instances, the “old” Christians were deemed clean (implying impurity for those newly converted). The church had long viewed converts on an equal playing field. 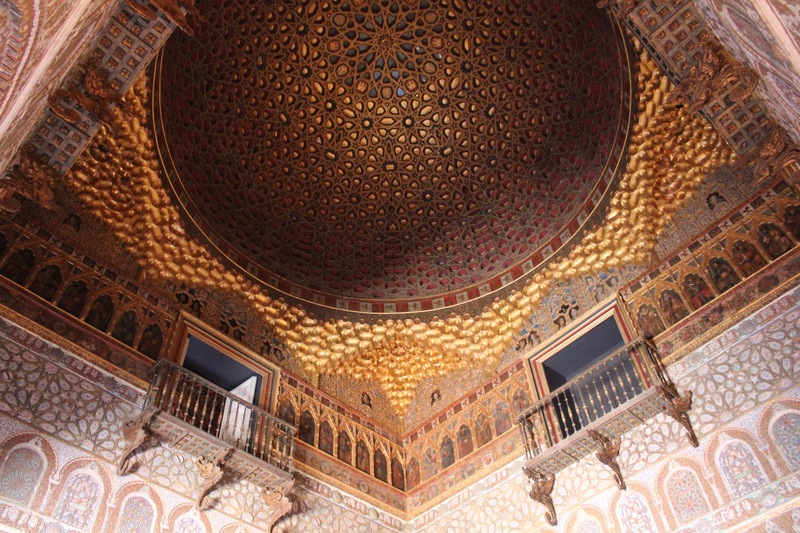 Rosa led us on a morning tour of Granada as we saw this juxtaposition once again of Islamic and Western architecture. 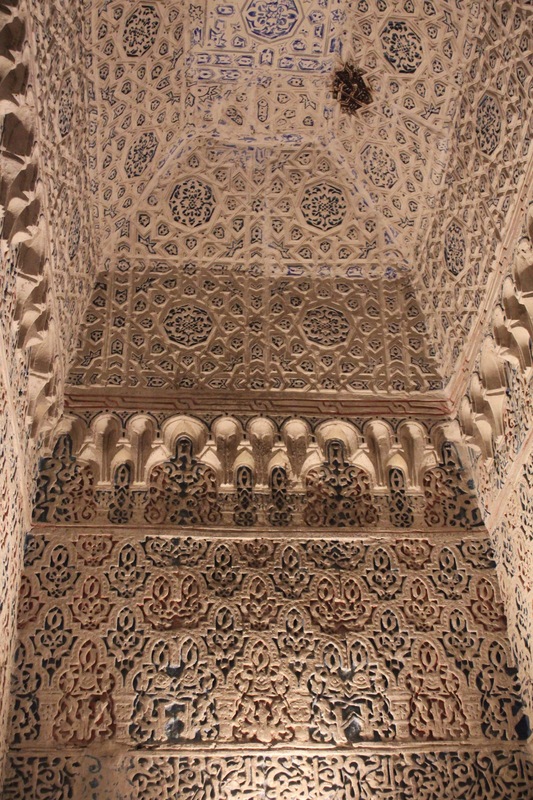 In fact, the style of architecture changes like in Granada later on than in other communities, strengthening the tie to a more moorish style. 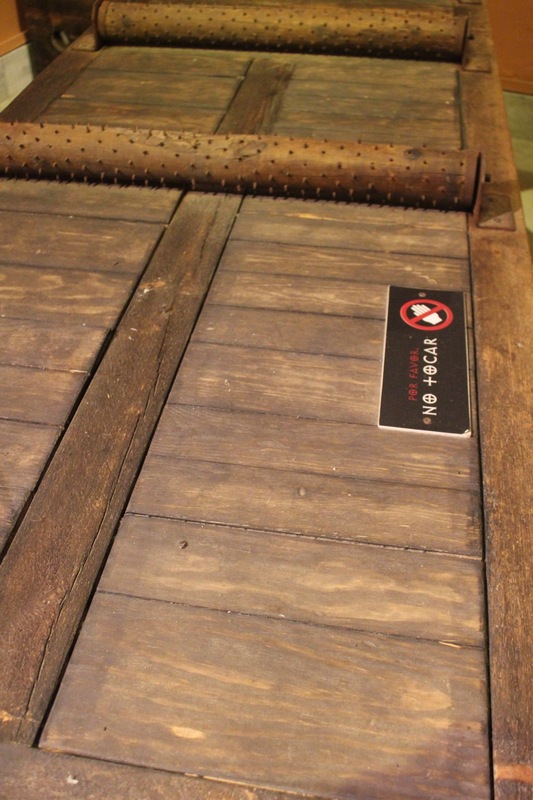 Our tour takes us to the museum of torture (Leora and I visited a Museo Della Tortura on our honeymoon while in San Gimignano, Italy), with a second floor tribute to the history of the Jews. The museum hosts a number of Jewish artifacts from Spain and throughout Europe with the hope of sharing the rich culture of the Jewish people (and therefore showing what was lost). We saw letters of conversos renouncing their Jewish faith, while using a secret code to communicate (writing in lemon!). Straight out of a National Treasure movie. 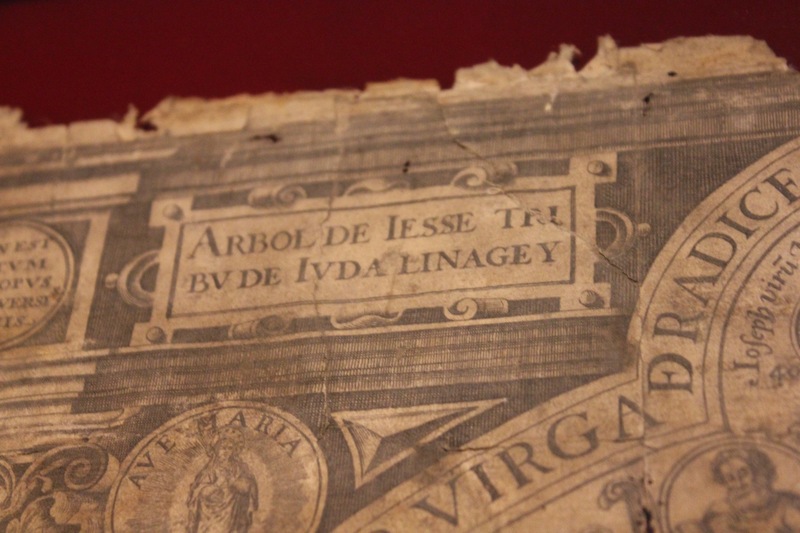 My favorite artifact on display had to be the Arbol de Jesse from Granada (1618). 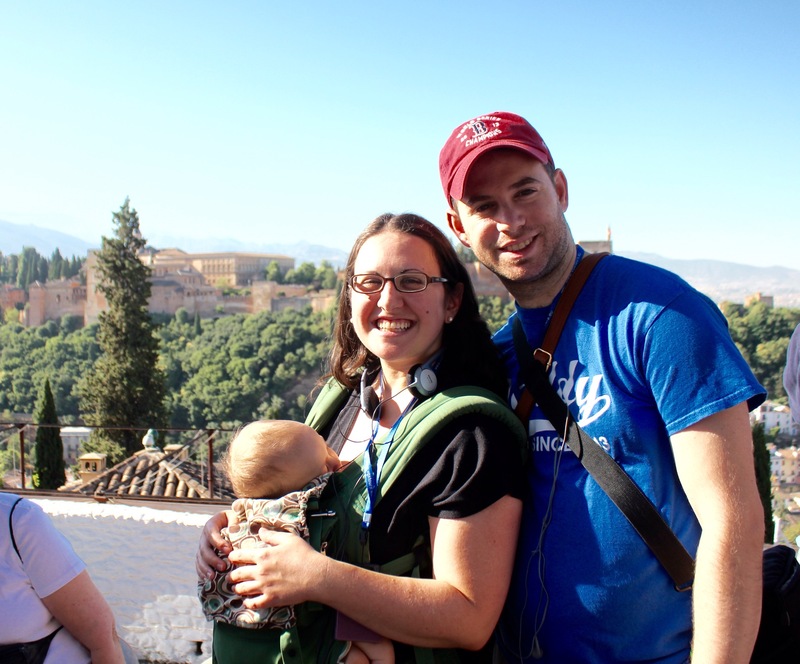 As we glanced over the hillside with a majestic view of the Alhambra Palace, Rosa explained that at one point during Muslim rule, occupants of Granada received their own land to become self sufficient. 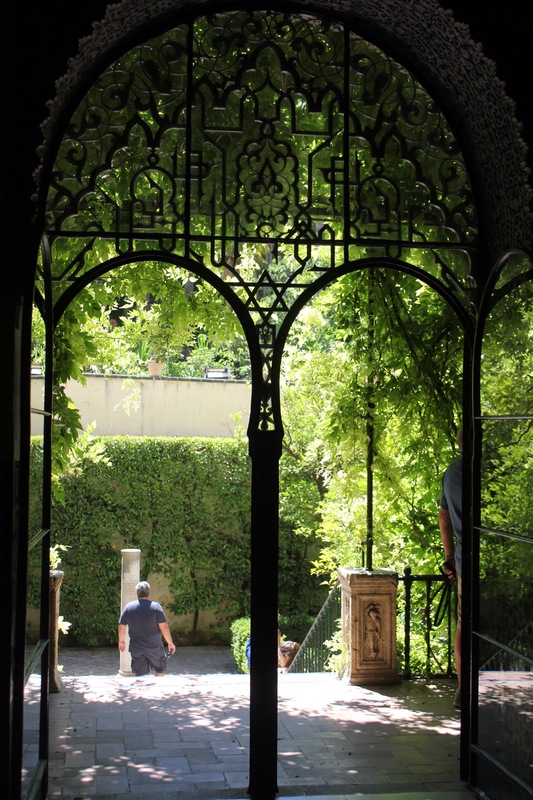 This makes a lot of sense given the way the Alhambra layout also has space for gardens in order to be self-sufficient. When the Christians took over, they kept hearing about all this land, called “Karen” (or Keren, as in Keren Kayemet Liyisrael), but they thought the locals were saying Carmen, so that’s why there are so many “Carmen” spaces throughout the region. As we depart for a 3 hour bus ride to Seville, we learn about the vast number of monasteries and convents. One monastery is now a boarding school, yet there are “19 convents and counting” within Granada. Sounds like a reality tv show in the making to me!! There were revolts amongst peasants, workers, middle class; strong anarchist and Marxist movements. The low point is La Semana Tragica, July 25-Aug 2 1909, known in English as the Tragic Week- a series of bloody confrontations between the Spanish army and the aforementioned working classes/anarchists/socialists. This unrest of 1909 couldn’t be seen in a Spanish vacuum when political theories and movements didn’t stop at the boarder crossing. With the Russian Revolution in October 1917, we see the appeal of communism and the fear of communism. The appeal had a messianic feel to it- families like the Rosenbergs appealed to the idea of communism (not for the $$$). The leftists were motivated to action while the right (against Lenin), stayed socialist. At the same time, since this is still a lecture on Spain, we see the last remnant of the Spanish empire in Spanish Morocco (we’ll learn later from our evening speaker of the various types of Moroccan Jews- Spanish, French, etc). The unpopular war in Morocco (in which 14,000 were slaughtered), with the humiliation of the Spanish armies contributed to the military coup of 1923. Primo De Rivera becomes dictator until 1930, when he leaves the country, followed by the monarchy (now the second expulsion of the monarchy of 1931 finally has context!!). Massive rioting eventually leads to the republic establishment in 1931. When Hitler ran for office in 1932, Stalin said he would be out in 6 months. However, when Communists and socialists would not make any alliances, Hitler had his stranglehold. In 1934, the Kremlin party line changes. Now, it’s all against fascism, known as the Popular Front. Socialists and Communists win mass majority in Spain. The Church and Republican army are obviously against it. With the summer revolt of 1936, Spain begins its Civil War. 1 million people die in the civil war. This civil war is the Vietnam of the 1930s. Franco’s side has unity, but it also has guns and aircraft. The Republic has nothing. Salazar, Mussolini and Germany provide funding to Franco and support Guernica. For the Republic side, the British and French send nada with their policy of appeasement in full effect. As Berk puts it, “no one wants to go in the meat grinder again.” America, too, is combatting isolationism. Berk points out people turning their backs on Jews because they didn’t support their cause during the civil war. This is right out of the second paragraph of the shema- you pat my back, I’ll pat yours, but if you don’t pat my back, I’m not going to pat yours. Stalin looks at the world through the prism of Leninism: as Hitler advances west, it must be a capitalist plot to release him eastward. As we know, perception is reality. We hear the story of Max litvinov, the Jewish foreign minister of Russia, replaced by Molitov. Molitov meets the German foreign minister as Hitler is about to invade Poland (Britain and France have alliance with Poland). The question arises- would Russia attack Germany from the east and make it a two front war? Or could Germany promise something in return for Russia’s help? Germany offers up Latvia, Lithuania, Estonia and part of the Ukraine. The Soviet people will not know about the deal until Gorbachev. This is all context for Franco’s iron fist rule from 1939-1975. Franco cracks down on all areas that would dare challenge him. For example, 7,000 high school teachers are executed during his reign. 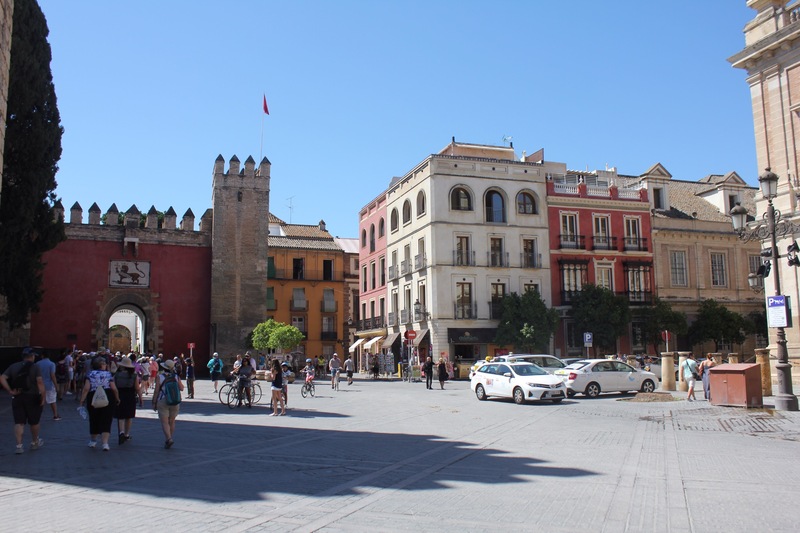 It’s getting late so I’ll just mention that we had a wonderful meeting with Moses Hazan, from Morocco (most Jews in Seville are from Morocco), who teaches us about the Jews of Seville (lowlight includes June 6 1391 progrom, Spanish Inquisition beginning in Seville in 1478, last trial in 1781) . Cantor Aaron BenSoussan led us in a Moroccan maariv and Cantor Dov Keren led a powerful El Malei prayer for those in the Sephardic community that perished.